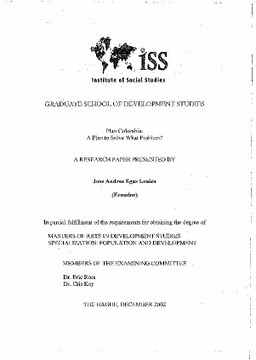 Erasmus University Thesis Repository: Plan Colombia: A Plan to Solve What Problem? Plan Colombia: A Plan to Solve What Problem? The recognition that Colombia is currently suffering from one of its worst national socio, economic and political crisis is probably the only point where the State, the guen'illa and paramilitary forces, and the civil society of Colombia in general, together with the international organizations and other foreign governments, agree .